Brian Sabean and Bruce Bochy have teamed up to assassinate the Giants’ offense. The league’s second-best pitching staff might be golfing in October as a result. The $126 million contract Sabean (and his bosses) gave Barry Zito five-plus years ago has obliterated the Giants’ budget — or at least given the team a handy excuse to make do with lousy lineups year after year. When Jose Reyes and Jimmy Rollins became available on the open market, the Giants figured, “no thanks, we’re good with a guy who’d be lucky to hit like Carlos Zambrano.” Bochy made matters worse last year by jerking around top prospect Brandon Belt, ejecting him from the lineup long before he had a chance to rack up a meaningful total of at-bats. He seems poised to do the same this year, with Nate Schierholtz and Aubrey Huff likely ticketed for starting roles and Belt left out of the mix again. Ironically, a rare fit of post-Zito spending has caused this problem: Had the Giants not given the nearly 34-year-old Huff a two-year, $22 million contract extension in the afterglow of the World Series, the Giants would look at least a game or two better than they do right now. In an NL West division where the young and upgraded Diamondbacks return to defend their crown, that game or two (or more) could prove costly. As uninspiring as this lineup is, there’s some upside even if Belt gets buried again. Huff has been one of baseball’s volatile players in the past three years, sandwiching two sub-replacement-level seasons around a six-win explosion in 2010; a sprinkle of positive regression wouldn’t be a surprise. Cabrera is a long shot to repeat the career-best 4.2 WAR that he posted last season, but he can still be a quality player, one much better suited for the corner position he’s playing this year than he was in center field last season. 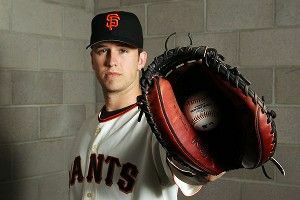 Of course, the biggest wild card is Posey: He was a four-win player in just 108 games as a rookie in 2010. If he’s all the way back from last year’s horrific injury, the Giants suddenly boast a three-four that can hang with a lot of the league’s better clubs … even if five through eight could be ugly. Getting Freddy Sanchez back from injury sometime soon (he might see spring training action as soon as Friday) could help. So would getting the 2010 version of Pagan (.341 wOBA) rather than the 2011 version (.313 wOBA — there was also a 30-run swing in defensive value, but that looks like a UZR quirk more than an actual collapse in his defense). Ah, here’s the good stuff. My favorite Giants stat from last year was that Lincecum was only the team’s third-most valuable pitcher; his strikeout rate edged lower and his walk rate has sneaked higher for two seasons in a row, with his fastball velocity down about 2 mph from Lincecum’s early-career peak above 94. This is more of a nod to Bumgarner the emerging star and Cain the rock of consistency than it is a slap at Lincecum, though. Only three left-handed starters posted a better strikeout-to-walk rate last year than Bumgarner’s 4.2-to-1: Clayton Kershaw, Cliff Lee, and Cole Hamels. Meanwhile, Cain continues to defy DIPS theory and other statistical truisms, giving up far fewer hits on balls in play and fewer homers on fly balls than you’d expect. The Giants aren’t necessarily known for cutting-edge analysis, but they know an excellent pitcher when they see one, and they’re working to sign Cain to a contract extension before he hits free agency this fall. Vogelsong is very likely to regress after a shockingly good 2011 season, but he’s still a great story who can be a better-than-average fourth starter. The starters get all the credit, but the Giants have run out one of baseball’s elite bullpens for two years running. The taco dude is good to very good depending on his command on a given night, but some of his relief mates are even better: Righty setup man Sergio Romo tossed just 48 innings last year, yet still ranked as the sixth-most valuable reliever in baseball, thanks to a preposterous 14-to-1 strikeout-to-walk rate, and Bochy gets good mileage out of LOOGY Javier Lopez. Throw in a defense that finished in the top 10 last year and the Giants should again rank at or near the top of the league in run prevention. A year from now, this pick will almost certainly be Gary Brown, the minor league center fielder who projects as a potential All-Star. For now we’ll close our eyes and say Belt, the soon-to-be-24-year-old who’s hit for both average and power at every minor league stop and just needs a prolonged opportunity to prove his worth. The Giants lean on their big three starters and strong bullpen, get a few good performances from normally mediocre veteran hitters, and ride that formula deep into the playoffs, like they did two years ago. A repeat of last season, where all that pitching gets wasted by a lineup stocked with too little thump and too much injury risk, resulting in the Giants losing out to the more balanced Diamondbacks and missing the playoffs.